OPEL MANTA Wiper Linkage 0000267026. Other Details: Mk 1 83-88 Mk1 Front Wiper Linkage. AB30-38, AB44-56, FK17-99, G83, IV1-28, IV30-39, IV52-54, IV63, KW1-14, PA21-33, PA34-40, PH18-26, PH30, PH31-41, PH49-50. Model - Mokka MK1. Notes - Genuine Opel Vauxhall Mokka MK1,Suitable forLHD andRHD Vehicles. Removed from: 2006 OPEL VAUXHALL ASTRA REAR WINDSCREEN WIPER ARM RHD. Both parties agree to submit to the exclusive jurisdiction of the courts located in the Republic of Ireland. refers to the cylinder head & block and the components which make these up (i.e. pistons, cam shafts, con rods, etc.). If you have any kind of problems. OPEL COMBO 2006 1.3 CDTI LHD FRONT WINDSCREEN WIPER ARMS ARM. Opel Astra G 2001 Heckscheibenwischerhalter 90559607 GPAC12551. Opel Astra G, other. Warranty on electronic devices is void if identifying mark is removed or has sign of tampering. Der Gegenstand ist voll Funktionstüchtig, kann aber unter Umständen Gebrauchsspuren aufweisen. Part codes 13188260. The car Opel Signum. Part position Front left. Body hatchback. Engine 103kw, 1800cc. We will help you to save your car perfectly. Part codes 13188258. The car Opel Signum. Body hatchback. Part position Front right. Engine 103kw, 1800cc. We will help you to save your car perfectly. The carOpel Zafira B. Body Parts. Warranty on electronic devices is void if identifying mark is removed or has sign of tampering. Looking for used car parts?. We have lots of spare parts listed, and about 500 000 spares in the warehouse! The carOpel Zafira B. Warranty on electronic devices is void if identifying mark is removed or has sign of tampering. Body Parts. An item that has been previously used. Item will be sold as it is shown in the pictures. Opel Vectra B 2000 Heckscheibenwischerhalter 90504980 GPAC12752. Opel Vectra B, other. Der Gegenstand ist voll Funktionstüchtig, kann aber unter Umständen Gebrauchsspuren aufweisen. (Kleinere Kratzer ect.). Opel Frontera Scheibenwischerarm Hinten. Opel Frontera Поводок стеклоочистителя заднего. Model: Frontera. Type of fuel: Other. Opel Vectra C 2003 Heckscheibenwischerhalter 80006717 GPAC11955. Opel Vectra C, other. Warranty on electronic devices is void if identifying mark is removed or has sign of tampering. Der Gegenstand ist voll Funktionstüchtig, kann aber unter Umständen Gebrauchsspuren aufweisen. The carOpel Astra H. Exhaust Parts. Warranty on electronic devices is void if identifying mark is removed or has sign of tampering. Body Parts. An item that has been previously used. Item will be sold as it is shown in the pictures. 56841757, 56840511. Opel Astra G 2000 Heckscheibenwischerhalter 56841757 GPAC12380. Opel Astra G, other. Warranty on electronic devices is void if identifying mark is removed or has sign of tampering. The carOpel Astra H. Exhaust Parts. Body Parts. Warranty on electronic devices is void if identifying mark is removed or has sign of tampering. Looking for used car parts?. We have lots of spare parts listed, and about 500 000 spares in the warehouse! Hi, i have for sale OPEL ASTRA J 2013 RHD TAILGATE BOOT LID REAR WIPER ARM. We will help to solve. Part codes: 90504174LH, 90504174, 183434. Model: Vectra B. Manufacturer: Opel. Fuel type: diesel. Part position: Front left. Steering: left side steering (eu). No weekend or after hours dispach available. The carOpel Antara. Warranty on electronic devices is void if identifying mark is removed or has sign of tampering. Body Parts. An item that has been previously used. Item will be sold as it is shown in the pictures. Rear wiper arm 13256919 Opel Astra J 09-18. Opel Astra J'09 -'18. Compare the part number (if any), looks and connections. EAN Nicht zutreffend. ASTRA VECTRA ZAFIRA . OPEL - VAUXHALL - ISUZU ORIGINAL PARTS - GENUINE PARTS. GRAB A BARGAIN!! I HAVE CLUTCHES, CABLES, VALVES, PISTONS, PISTON RINGS, CRANKSHAFT BUSHINGS. SO I'M NOT SURE WHAT CARS/MODELS/YEARS THESE PARTS FIT ON BUT I'LL TRY TO DO MY BEST TO HELP YOU. Model - Astra J. Notes - Genuine Opel Suitable forLHD andRHD Vehicles. Year of Manufacture - 2014. 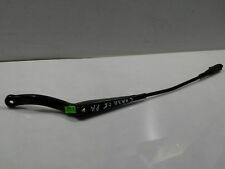 VAUXHALL ASTRA F CC WINDSHIELD WIPER Rear 90341915 fab. Year 09/1994-02/1998. Part Number: 90341915. Models: Opel Astra F CC hatchback. It is sold : wiper rear. Construction period 09/1994-02/1998. The carOpel Astra J. Body Parts. Warranty on electronic devices is void if identifying mark is removed or has sign of tampering. Looking for used car parts?. We have lots of spare parts listed, and about 500 000 spares in the warehouse! Windshield wiper linkage Opel INSIGNIA A Sports Tourer (7.13-4.17). OE Number: 90493822lh 90493823rh. Manufacturer: Opel. Type: Caravan. Light scratches or scuffs are in used parts as normal level, since they usually quite a few years on the vehicle were built. Fuel: Petrol. Windshield wiper linkage Opel ZAFIRA A (F75) (4.99-6.05). Part codes: 09185813RH, 09185813, 166223. Model: Signum. Fuel type: petrol. Manufacturer: Opel. Part position: Front right. Steering: left side steering (eu). No weekend or after hours dispach available. Discription:Opel Corsa A Mk1 Windshield Wiper Arms. Years, engine2006m., 77kw, 1598cc. The carOpel Astra H. Exhaust Parts. Body Parts. Warranty on electronic devices is void if identifying mark is removed or has sign of tampering. Looking for used car parts?. Wiper arm wiper arm rear wiper arm rear liftgate D Opel Corsa. Models:; Corsa D;. WIPER ARM-TAILGATE. Opel catalog no. : 1273090. Condition: very good. Windshield wiper linkage Opel INSIGNIA A (7.08-8.13). Wiper arm windscreen wiper arm front left Primastar Renault Trafic Vivaro Opel. Models:; Vivaro;. WIPER ARM - FRONT WINDOW, LINKS-LL. Storage location: O50 X8302 VL 27.41 03/18/2019. Opel Catalog No: 4408566. Part codes: 90504175RH, 183430, 90504175. Model: Vectra B. Manufacturer: Opel. Fuel type: diesel. Part position: Front right. Steering: left side steering (eu). No weekend or after hours dispach available.